The use of organic–inorganic hybrid compounds containing tetraethoxysilane (TEOS) and hydroxyl-terminated polydimethylsiloxane (PDMS-OH) is one of the most promising approaches for using alkoxysilane-based formulations to improve the effectiveness of the consolidation of traditional silicate artifacts, such as ancient stone. Based on analysis of existing damaged potteries influenced by the crystallization of NaCl salt, the hybrid we prepared in this study provided a crack-free and homogeneous gel on the premise of appropriate PDMS-OH content. The consolidants were applied to samples prepared following procedures that simulate old pottery and the effect of the protective products was evaluated by characterizing the surface morphology, the determination of the consolidant uptake, color changes, water vapour permeability and several wet-dry cycles with salt. The best formulation found for the hybrid in the present work was made up of 10% PDMS-OH with TEOS, which showed a significant increase in compressive strength, with a value of 3.50 MPa at 3 mm depth of consolidation, similar to the sample treated with Primal SF(the commercial protective agents used for comparison purposes), which had 3.20 MPa in compressive strength at 2 mm depth of consolidation. Except for small color changes and excellent water vapor permeability, there was still no significant change, and the destructive effects from NaCl crystallization for the hydrophobic surface of the sample treated with hybrid material was different to what happened for the hydrophilic case in the original. Thus, this study has revealed, for the first time, the addition of an appropriate amount of PDMS-OH to TEOS helps to improve the mechanical properties, hydrophobic behavior and salt resistance of damaged pottery effloresced by the NaCl crystals; in addition small color changes and excellent water vapor permeability should also be taken into consideration. The Qin Tombs at Dianzi, Longxian County, China, compiled by the Shaanxi Provincial Institute of Archaeology, is so far the first monographic report on the excavation of Qin tombs. It described 224 tombs from the earliest Spring-Autumn and Warring States period (B.C.776-476) to the Qin dynasty(B.C.221-206), and the majority of the funeral artifacts in the tombs were potteries including different shapes of jars, plates, pots and stoves etc, which involve grand modeling and decorative patterns such as graceful figures. While some efflorescence and a small amount of white crystals could be observed on the opposite decorative surface of the beautiful patterns (Figure 1), the results of energy-dispersive X-ray fluorescence spectrometry and X-ray diffraction analysis showed the structure of well-substrate samples mainly composed of α-SiO2, sodium feldspar, calcium feldspar and ε-Fe2O3 etc, and the water absorption was much more than 15% and the compressive strength was less than 20 MPa. The salt content in the damaged pottery (in contrast to the non-destructive samples) was much more than 3%(wt%), and ion chromatography analysis indicated, the anion was mainly Cl- in salt solution and the cations were mainly composed of Na+, Ca2+, Mg2+and K+ with Na+ dominating. X-ray diffraction analysis and microscopic morphology analysis showed the crystallization phase of NaCl dominated in the salt and multilayer of fracture and failure structure was distributed in the surface of damaged pottery (Figure 2). SEM-EDS of the surface of damaged sample. At present, the employment of appropriate protective materials for consolidation is one of the most direct and effective methods to slow down the destruction of ancient silicate artifacts damaged by the salt decay. Cocca, M  studied the only Acrilem IC15 with excellent chemical-physical properties and durability in different commercial products such as Primal AC33, Primal B-60A, Acrilem IC15 and Acrilem IC79 for conservation of colored pottery, Vaz, M.F  also discussed the effectiveness of impregnation treatment with acrylic Paraloid B-72 on the properties of old Portuguese ceramic tiles. At the same time, the characterization and analysis of nanolimes, acrylic and vinyl polymers in nanocontainer solutions, as well as particle-modified consolidants have been applied to ancient stone conservation [3–5]. As we know, tetraethoxysilane and its oligomers were the main components in a series of commercial formulations known as stone consolidants, which were intended to preserve decayed stone of historical buildings [6–11]. Zárraga R., Kim, E.K., et al [12–14] studied stone consolidants with the addition of hydroxyl-terminated polydimethylsiloxane, silica nanoparticles and (3-glycidoxypropyl) methyldiethoxysilane as well as polyhedral oligomeric silsesquioxane to tetraethoxysilane. 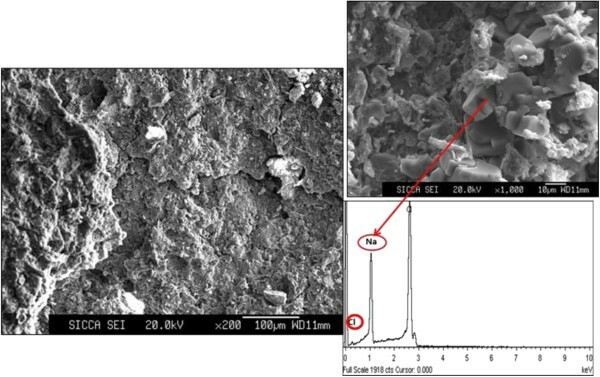 The results indicated organic–inorganic hybrid compounds provided the necessary flexibility to resist the stress imposed by capillary pressure and an important hydrophobic character was imparted to the stone. There have been abundant reports about salt decay and the consolidation of damaged stone, fresco, wall painting, statues, tombs, ancient buildings and so on [15–32], but there is a scarcity of literature involved in the conservation of damaged pottery induced by soluble salt. It was necessary to study the properties of protective materials and the performance of a protective effect on damaged pottery samples, and evaluate negative effects induced by salt decay in the treated sample. Specifically, based on analysis of the existing damaged pottery influenced by the soluble NaCl salt, we used FTIR and SEM techniques to investigate how a TEOS-based consolidant formulation was influenced by the addition of PDMS-OH when DBTL was used as a catalyst. The simulated samples were prepared as two types to avoid the possibility of destroying scarce and precious relics during the protective process in our experiment. Mechanical tests, water absorption and water vapor permeability, as well as negative effects induced by wet-dry cycles with the salt measurements on the treated simulated samples, were also performed in order to determine the modification effects of this important consolidation. Analytical grade tetraethoxysilane (TEOS) was obtained from Shanghai Lingfeng Chemcal Reagent Co., Ltd, hydroxyl-terminated polydimethylsiloxane (PDMS-OH) was purchased from Shanghai Meryer Co., Ltd, which had a viscosity of 35-45cst (molecular mass 700–1500) and an OH percentage of 3-4% w/w. Dibutyltindiauate (DBLT) was purchased from Aladdin Reagent Co. Ltd, which was used as a catalyst for the sol–gel reaction at a neutral pH. Commercial protective agents Primal SF (methyl acrylate and methyl methacrylate copolymer, solid content 40%, Beiluo restoration technology) and WD10 (Dodecyltrimethoxysilane, WD silicon Co., Ltd.) were also used for comparison purpose. A series of five hybrid sols were prepared using as starting materials 10 ml of TEOS, and 1, 3, 5, 10 and 20% (w/w) PDMS-OH, respectively. Ultrasonic agitation of TEOS/PDMS-OH mixtures was performed for 24 h in order to obtain homogeneous solutions. After that, 1% (w/w) of DBTL catalyst was added to each sol, allowing ultrasonic agitation for five more minutes. Sol–gel reaction and drying occured by simple exposure of the cast sols to laboratory conditions at relative humidity of 60% and temperature of 25°C until a constant weight was reached. 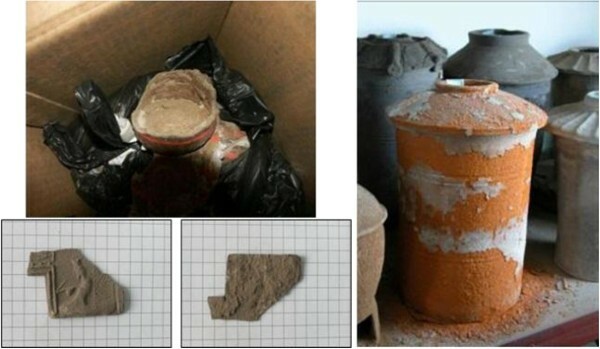 In order to avoid the possibility of destroying scarce and precious relics during the protective process in our experiment, the raw materials of simulated samples were taken from the screening clay in the 0.150 mm sieve size of Qin Shi Huang Mausoleum and prepared as two types (Figure 3). For Type (1) in Figure 3a, the raw materials were burned at 700°C, which was similar to the firing temperature of damaged ancient pottery, and the composition of fired-clay simulated sample was tested and mainly composed of SiO2(63.36%), Al2O3(14.17%), CaO(8.26%), Fe2O3(4.42%), MgO(3.38%), K2O(3.03%), Na2O (1.97%) etc. Weighing the same weight of fired-clay simulated powders 2.00 g and pouring into the polyethylene mold in diameter of 2.5 cm respectively, the depth of powder samples in the mold was 6 mm. The fired-clay powders were consolidated with the protective material separately and 5 ml was used in the drip method to penetrate into the bottom of mold. The treated powder samples were exposed at room temperature until a complete reaction occurred (ca. 1 week). In order to meet the requirements of the water vapor permeability test and salt resistance test, the two sizes 50*50*2 mm and 50*50*20 cm of unfired simulated specimen in Type (2) Figure 3b were suppressed in PRESS at initial pressure 1 MPa and high pressure 5 MPa. The pressed samples were dried in the oven at 110°C for 5 h to prevent cracking of sample in the following 700°C firing process. The protective materials were applied to simulated specimens by immersion application and all specimens were obtained for consistency. The data here were the average of 5 samples, the physical properties of the fired-clay simulated samples type (2) were tested and the density was 1.69 g/cm3, the porosity(% by volume) was 37%, and the compressive stress had an average of 11.02 MPa. Simulated sample and protection treatment process (a) type 1 (b) type 2. 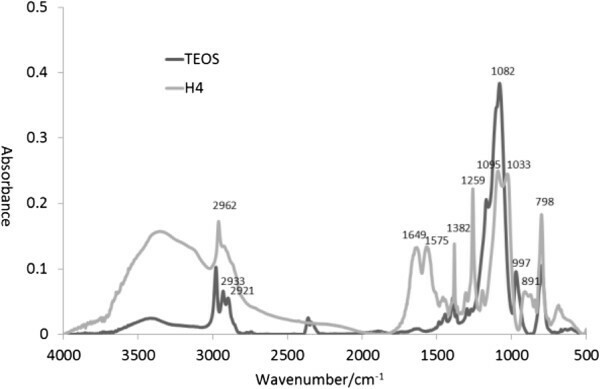 Fourier transform infrared (FTIR) spectra of the gels were measured on a Spectrum 100 (Perkin-Elmer, Inc.) instrument equipped with an attenuated total reflectance (ATR) detector at a resolution of 4 cm-1. 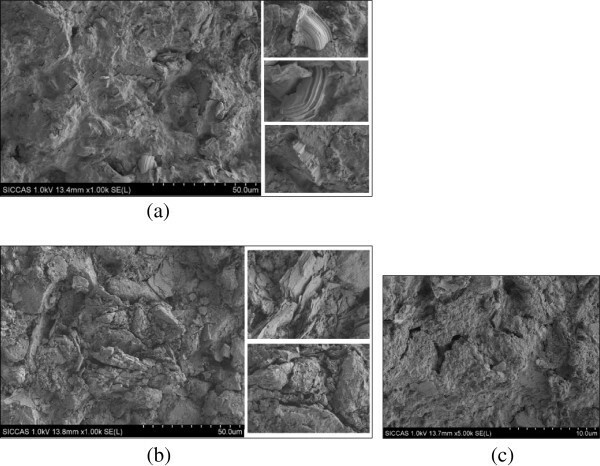 The morphologies of the hybrid materials, the treated fired-clay simulated samples and the evaluation of salt effects were investigated using a JSM-6300 scanning electron microscope at accelerating voltage with secondary electrons under various magnifications to obtain the clear display (JEOL Ltd.). The consolidant uptake, or the amount of polymer retained was measured gravimetrically. The pristine sample was weighed (W0) after being completely dried and then treated with a consolidant solution with immersion method for 24 h and dried at room temperature until a complete reaction occurred. The treated sample was weighed (Wt) after complete drying and the applied consolidant uptake was estimated using the expression: consolidant uptake (%) = (Wt-W0)/W0×100, where Wt and W0 were the masses of the samples treated with and without consolidant, respectively (in grams). Compressive strength test was carried out on the overlying protected samples up to about 10 mm depth by means of an Instron-5500R universal testing instrument operating with a crosshead speed of 0.5 mm/min at a temperature of 25°C. The value of each sample was decided by the numbers of sample into the total value of the test results. Multiple measurements for each test were performed to avoid the absolute error of measurement and the standard deviation was always lower than 5%. The color changes between untreated simulated samples and treated samples were evaluated by measuring the spectrum reflectance with the CIE 1976 L*a*b* color parameters, using a commercial colorimeter (Minolta CM700d). The contact angles were measured with a 5 μL water droplet at ambient temperature with an optical contact angle meter (DSA100 of Kruss Instruments Ltd, Germany). The reported values of contact angles were averages of five measurements made on different points of the sample surface. Water vapor permeability in the sample slabs was measured using the standard cup test . The saturated relative humidity (RH) maintained with each slab as a cover on a cup was sealed up, and the external RH was kept at 60% in this test. The mass of the system was recorded regularly and the resistance to water vapor diffusion coefficients was calculated. It is expressed as the ratio between the weight variation of the whole system in 24 h and the area of the sample surface with diameter of 25 mm and thickness of 2 mm, according to the formula to calculate the vapor diffusion resistance μ: μ=(P×δL)/[M/(t×s×d)], in which P was the vapor pressure at the testing temperature (Pa), δL was the vapor constant in the air (7.02×10-7 kg/m•h•Pa), M was the vapor pervasion mass (kg), t was the testing time (h), s was the sample area (m2), and d was the sample thickness (mm). The permeability test was carried out on five samples for each series, and the mean permeability values and their standard deviations were evaluated using statistical analysis (standard deviations were always lower than 5%). The influence of the environmental conditions in the damage procedure during preliminary tests showed that the use of a high, but still realistic, temperature could enhance salt damage, while the use of wet-dry cycles was found to be more effective than a continuous immersion of the specimens in salt solution . About 3% of dry salt in the specimen was expressed by way of immersing the specimen (50*50*20 mm) in 10% (wt%) NaCl solution for 24 h. Once 80% of the water had evaporated, the specimens were re-wetted, by capillary rise from the bottom, with a quantity of demi-water equal to the quantity of solution used in the first wet-dry cycle. The experimental condition was selected as 4 h at 20°C 50% RH followed by 4 h at 20°C 96% RH, in which crystallization-dissolution cycles more frequently than what was obtained by rewetting and drying the specimen for a long time. Any appearance of damage (type and seriousness) and efflorescence was recorded. All TEOS/PDMS-OH solutions were homogeneous and stable in closed bottles for up to 6 months. The gels obtained from the TEOS solution alone were brittle. The serial numbers and photographs of the gel obtained from the different solutions are shown in Figure 4. After drying under laboratory conditions, a large number of crack reductions were observed beginning with the gel containing 3% of PDMS-OH(H2) and ending with 20%(H5) additives. The homogeneity of the gels indicated that PDMS-OH containing 5-10% was well integrated into the inorganic silica skeleton respectively, which is indicated in the molecular structure expressed. Photographs of the gel obtained different PDMS-OH in solutions (a) H2 (b) H3 (c) H4 (d) H5. The sol–gel reaction of the hybrid solution was confirmed via ATR-FTIR, which is shown in Figure 5. The band at 2921 cm-1-2962-1 could be assigned to stretching of the C-H bond and the peaks at 1382 cm-1 and 997 cm-1 were attributed to the -OC2H5 bond for TEOS. For the materials containing 10% of PDMS-OH studied here, the peaks at 1649 cm-1 and 1575 cm-1 were attributed to the Si-OH bond, and the peaks at 2962 cm-1, 1382 cm-1, 1259 cm-1, and 798 cm-1 were attributed to the Si-(CH3)2 bond, according to the literature. There was a very pronounced band appearing at 1033 cm-1 and 891 cm-1 for the Si-O-Si bond, which corresponded to the asymmetric and symmetric stretching and bending peaks of the Si-O-Si groups, indicating that all samples were mainly composed of a silica network and the copolymerization reaction took place between Si-OH groups of hydrolyzed TEOS and Si-OH groups of PDMS molecules. The copolymerization and synthesis of effective and homogeneous organic–inorganic hybrid was confirmed with the covalently bonded PDMS-OH to silica particles. Spectra for the protective materials under study. The morphology of the surface of hybrid materials was investigated by SEM analyses. Figure 6a and b show the SEM images of hybrid containing 10% (H4) and 20% (H5) PDMS-OH in the presence of TEOS, respectively. The silica aggregates, having a size of around 50-100 nm in hybrid H4, are evident in Figure 6a, and the average size of aggregated silica grew larger with the higher PDMS-OH up to 20% shown in Figure 6b. The inorganic particles generated in-situ were well dispersed within the organic network at nanometre size range. H4 with 10% PDMS-OH as a typical macroporous and the homogeneous material, in which the macroscopic silica phase separation was prevented as in-situ sol–gel process, provided improved surface adhesion properties. Morphology of the hybrid materials (a) 10% PDMS-OH (b) 20% PDMS-OH contained in solutions. The excellent hybrid material, TEOS containing 10% PDMS-OH was selected for the consolidation of simulated fired-clay sample, and commercial protective agents dodecyltrimethoxysilane WD10 and acrylic emulsion Primal SF were also used for comparison purposes. 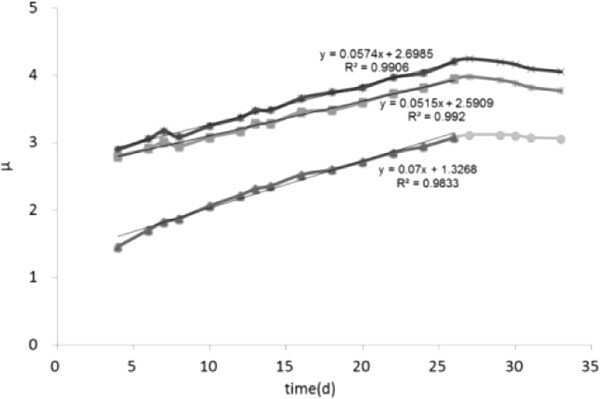 The condition of consolidative appearance is showed in Figure 7, and the values of consolidant uptake and the mass changes in the simulated type (1) are shown in Figure 8. As expected for a strong water-repellent product, the rate of mass change and consolidant uptake was significantly lower for WD10 than others, 32 h of dry time and 3.25% of increased mass for the untreated samples. 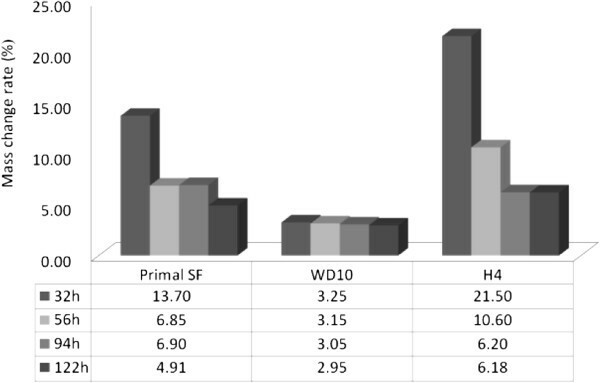 The process of drying time for the Primal SF was about 122 h, which was higher than that in the hybrid H4 about 94 h, whereas the consolidant uptake in hybrid H4 was about 6.2%, much higher than that in the Primal SF(4.91%) treated sample. The results indicated the shorter consolidated time was cost and the more hybrid materials were absorbed for the samples treated by hybrid H4. 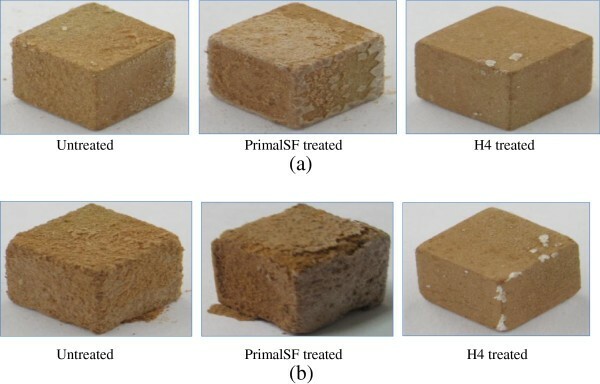 Appearance of treated sample (a) untreated (b)the surface of PrimalSF treated (c) the interior of PrimalSF treated (d) the surface of H4 treated (e) the interior of H4 treated (f) the surface of WD10 treated. Consolidant uptakes of treated samples. The same as for the properties of the untreated powder samples (Figure 7a), there was a highly scattered and dispersed, loose structure, and a barely cohesive force in the particles of the accumulated powder for WD10 treated sample. Contrarily, the water absorption, apparent porosity and bulk density of Primal SF and H4 treated samples were measured easily and the results are given in Table 1. The water absorption of the powder sample came to 27.49% and 28.49%, respectively, after application of protective materials Primal SF and H4 treated, and the apparent porosity changed to 39.01% and 38.35%, with the bulk density changing to 1.42 g/cm3 and 1.35 g/cm3 separately for the Primal SF and H4 treated, which indicated the application of the H4 products was associated with similar water absorption, porosity and bulk density to Primal SF products. The increase of mechanical strength in the powder sample after treatment with the protective products under study was evaluated by consolidation depth and compressive strength. Regarding the hybrid material formulations, a progressive increase in mechanical strength was found in line with PDMS-OH content. The sample treated with TEOS containing 10% PDMS-OH showed a significant increase in compressive strength, with a value of 3.50 MPa at 3 mm depth of consolidation, higher than that in the sample treated with Primal SF, which had 3.20 MPa in compressive strength at 2 mm depth of consolidation. As we studied, there was some differentiation in the mechanical strength of the surface and interior of the treated samples manifesting with different contact angle and color (Figure 7). The contact angles for the surface and interior of hybrid treated sample was up to 105.91 and 100.65, respectively, higher than those for the Primal SF treated sample which were 79.57 and 70.91. The total color difference of spectrum reflectance (R) in the powder sample before and after treatment is given in Figure 9, which indicates the reflectance curve in untreated samples, with the highest reflectance up to 40% at 700 nm, higher than that in the samples treated with the hybrid materials H4 and the Primal SF. Obviously, the decreased degree of reflectance curve in hybrid H4 treated sample was less than that in Primal SF treated, specifically about 10.84% and 35.98% in reflectivity at 555 nm, where the light yellow-green was the most sensitive spectrum for human eye. Total color difference of spectrum reflectance for the powder sample (a) Primal SF (b) H4. There is similarity in the trajectory of three curves of resistance to water vapor diffusion coefficient in Figure 10. The resistance to water vapor diffusion coefficient μ remained stabilized when the test time was up to 26d, and the relative humidity reached equilibrium inside and outside the vessel. Rapid prediction of resistance to water vapor diffusion capacity by multiple linear regression analysis for the first 26 days of the movement of μ, the linear regression equation was y=0.070x+1.32, y=0.057x+2.70 and y=0.052x+2.60 for the untreated sample, and samples treated with Primal SF and H4 consolidation, respectively, with a coefficient of determination (r2) of 0.9833, 0.9906 and 0.9920. In the linear regression equation for external environment temperature of 25°C and relative humidity of 60%, the intercept of the linear equation, 1.32 in the untreated sample was almost half that of 2.70 and 2.60 in the treated samples, and the growth rate of water vapor movement was 0.070, 0.057 and 0.052 for the untreated sample, and samples treated with Primal SF and H4 consolidation, respectively, which indicated the fastest rate of movement and excellent vapor diffusion capacity in the untreated sample. Still some open porosity was reserved in the pottery pores after TEOS-based consolidation for decreasing water uptake to some extent. Resistance to water vapor diffusion coefficient of treated samples. All samples were examined using SEM to provide further information concerning any difference in the morphology of surfaces and the interior of the untreated and treated samples. At the magnification employed, a high degree of scattering was observed with a barely cohesive force of particles accumulated in untreated powder sample (Figure 11a), while the close bonding of scattered powders and dense and smooth polymer coating appeared on the surface of Primal SF treated sample (Figure 11b). The interior had a relative poor one (Figure 11c). The SEM images in Figure 11d and Figure 11e show that the surface and the interior of sample treated with H4 products were covered with a gel coating with cohesive force and simultaneously a great porosity, but no reticular membrane formation was taken. The consolidants played a great role for the scattered particles. SEM morphologies of sample (a) untreated (b) surface of sample treated by Primal SF (c) interior of sample treated by PrimalSF (d) surface of sample treated by hybrid material (e) interior of sample treated by hybrid material. The use of wet-dry cycles was found to be more effective than a continuous immersion of the specimens in salt solution. Photos were taken to record any appearance of damage and efflorescence (Figure 12). After 28 wetting-drying cycles, crystalline salt particles on the surface of the specimens and a small amount of grains were observed for the untreated fired-clay samples, which affirmed efflorescence, and the efflorescence became serious with the grains falling off from the surface layer of untreated sample after 78 cycles. Salt decay mainly occurred when salt crystallization was produced at a certain distance beneath the external surface. This kind of crystallization formed subflorescence which was usually a fraction of a millimeter to a few millimeters from the surface, and produced outward blistering and peeling which in turn flakes off or powders away. The same as for the untreated specimen, the sample treated with Primal SF also had a small quantity of grains at 28 wetting-drying cycles. Nevertheless, a coating, surely the cambium of reticular formation of organic compounds Primal SF, as the membranoid substance fell off from the substrate of treated sample at 78 cycles. However, no appearance of damage and efflorescence was observed on the surface of H4 treated sample even after 100 cycles in our experiment. Appearance of damage and efflorescence (a) after 28 wetting-drying cycles (b) after 78 wetting-drying cycles. The types of damage obtained were similar to the ones observed on historic potteries, in which efflorescence and peeling off were the two of the most common types in unearthed potteries applied on salt loaded substrates, and the salt easily crystallized during the evaporation of water. Specific analysis in Figure 13a shows that a lamellar structure with incrustation could be observed on the microscopic photomicrograph of one cycle for the untreated fired-clay sample. The evaporation of solvent water in the NaCl solutions on a hydrophilic surface resulted in the formation of small crystals like falciform, forniciform, lump, protruding plate and worm-like structure at the liquid-air interface, and the liquid–vapor interfacial tension was increased as for the growth of these crystals at 28 cycles of wetting-drying, which leads to the observation of scattered cracks in the grains and the layers of the matrix (Figure 13b). For the samples treated by the organic compound Primal SF, at 28 wetting-drying cycles (Figure 13c), it was to be conferred the water evaporated from the interior of the sample which restricted with the existence of the independent reticular membrane on the surface of the fired-clay sample, the phenomenological separation between the surface in reticular membrane and the substrate, the cracks of reticular membrane appeared with the crystallization and the growth of the salt in the pottery substrates. The interface tension increased swiftly between the independent reticular membrane and the coterminous pottery substrates until the separation of these two joint part, which was responsible for the secondary decay of the treated sample. SEM morphologies of sample (a) after 1 wetting-drying cycles of untreated sample (b) after 28 wetting-drying cycles of untreated sample (c) after 28 wetting-drying cycles of Primal SF treated sample. 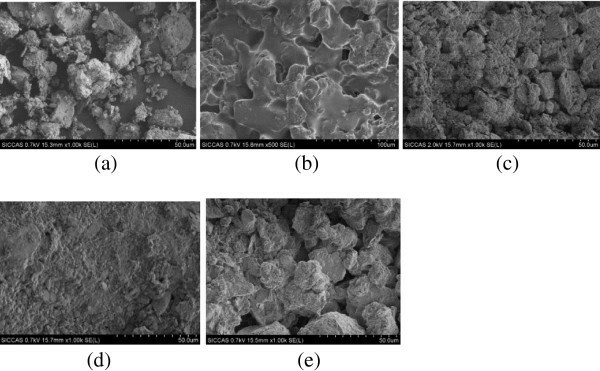 Based on analysis of existing damaged pottery influenced by NaCl salt decay, we used FTIR and SEM techniques to investigate how a TEOS-based consolidant formulation was influenced by the addition of PDMS-OH when DBTL was used as catalyst. The sample treated with TEOS containing 10% PDMS-OH showed a significant increase in compressive strength – the value was 3.50 MPa at 3 mm depth of consolidation, which is similar to the sample treated with Primal SF, which had 3.20 MPa in compressive strength at 2 mm depth. On a hydrophobic surface of sample treated with hybrid material, in contrast to what happened for the hydrophilic case in the original, there were still no significant changes or damaging effects caused by the NaCl crystallization. We have demonstrated that the addition of PDMS-OH to TEOS helps to achieve effective consolidation of damaged pottery as the PDMS-OH content improved the mechanical properties, hydrophobic behavior and salt resistance of the pottery; in addition small color changes and excellent water vapor permeability should also be taken into consideration. This work was financially supported by National Basic Research Program of China (973 Program) (Grant No. 2012CB720901) and key program of the Natural Science Foundation of China (Grant No. 51232008). The authors gratefully thank the Longxian Museum for kindly supplying the damaged pottery. JZ carried out the synthesis of organic-inorganic hybrid compounds and the analysis of protective properties of damaged pottery samples, participated in the microscopic studies and drafted the manuscript. All authors read and approved the final manuscript.